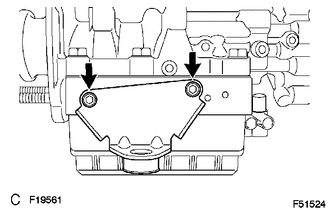 (a) Using a hexagon wrench (5 mm), remove the screw and brake actuator bracket No. 1. 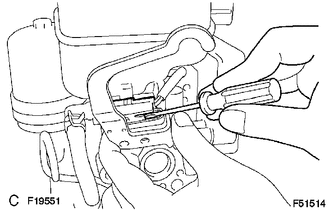 (b) Using a screwdriver, remove the fluid level warning switch connector. 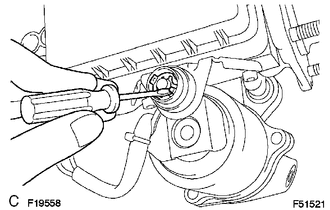 (a) Remove the screw from the master cylinder reservoir. 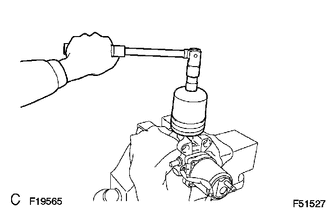 (b) Using a pin punch and hammer, remove the pin from the master cylinder reservoir. 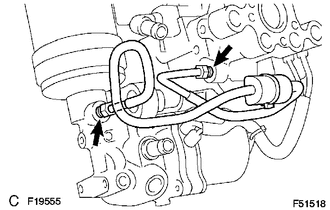 (c) Pull out the master cylinder reservoir. (d) Remove the 3 grommets. (a) Using needle-nose pliers, slide the 2 clips. 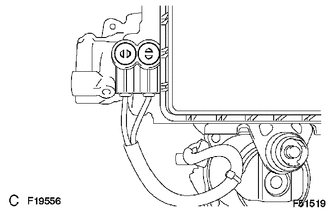 (b) Remove the brake actuator hose. 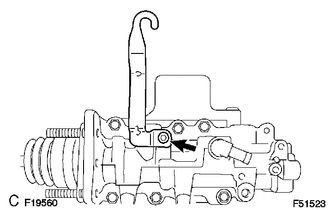 (a) Using a union nut wrench, remove the brake actuator tube No. 1. (a) Using a screwdriver, remove the 2 plugs. (b) Remove the 2 screws and pull the wire harness. (c) Using a screwdriver, remove the clip. 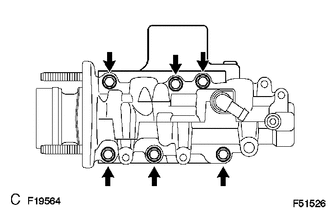 (d) Remove the brake booster w/ accumulator pump assembly. (e) Using a hexagon wrench (4 mm), remove the 2 pins. 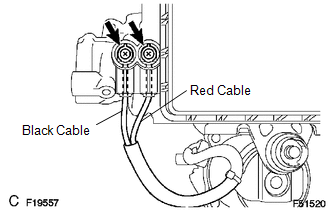 (f) Remove the 2 bushes and 2 collars from the brake booster with accumulator pump assembly. 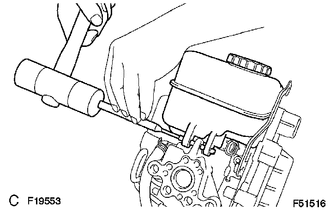 (a) Using a hexagon wrench (5 mm), remove the screw and brake actuator bracket. (a) Using a hexagon wrench (5 mm), remove the 2 screws and brake booster pump bracket. (b) Remove the bush from the brake booster pump bracket. 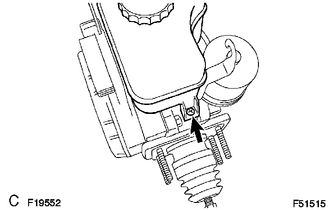 (a) Loosen the lock nut on the brake master cylinder side, and then remove the rod operating adapter and lock nut. (b) Loosen the lock nut on the rod operating adapter, and then remove the push rod clevis and lock nut. 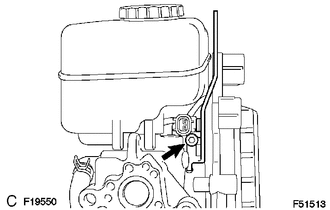 (a) Which pressing in the piston with a screwdriver, use a pin or equivalent to push the C-ring from the hole in the master cylinder body. Then remove the snap ring with another screwdriver. 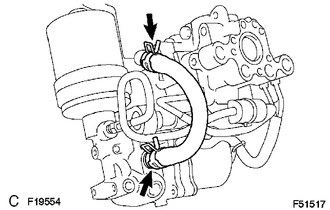 (b) Remove the piston by pulling it straight out, not at an angle. 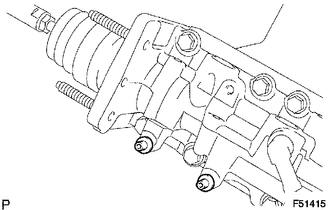 (b) Remove the master cylinder solenoid and the gasket. 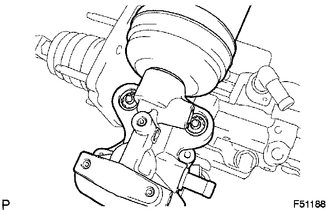 (a) Place the brake booster with accumulator pump assembly in a vise with a cloth. 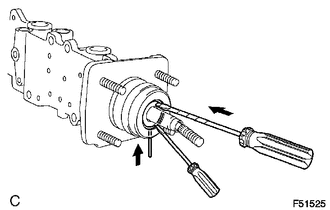 (b) Using a socket wrench (17 mm), remove the brake booster accumulator. (c) Remove the brake booster accumulator pipe, compression spring and O-ring.